As the weather gets colder my mind starts to wander to the best smelling shop on the high street: LUSH. This time of year means plenty of hot baths, and that means plenty of bath bombs and bubbles. 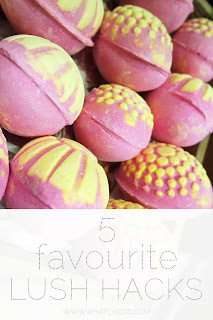 I do love me some LUSH treats, but due to the quality and fair trade of their ingredients, they are pretty pricey, so I like to find ways to make them work hard for my money. 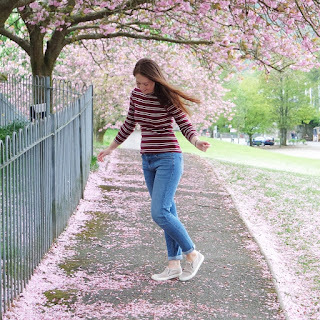 I've partnered up with lifestyle blogger Katy, from The Lilac Scrapbook, to bring you my top 5 hacks to do exactly that, while she shares her 5 favourite products to pick up. 1. If your hair feels congested or flat, use a salt scrub like Rub Rub Rub before shampooing to thoroughly cleanse and invigorate the scalp while the salt boosts volume. You can also use the scrub to massage and exfoliate tired feet, then dunk them in a tub of hot water. The salt will dissolve to make a lovely soak, totally rejuvenating your tired tootsies. 2. If you haven't got enough face mask left to cover your face, pour in some coconut or almond oil and mix. You can use this as a mask or cleanser then wipe off with a hot flannel, and your skin will be moisturised from the oil as well as benefiting from the mask. 3. I hate the soapy feeling of bubble bars on my hands, and I don't like holding them under hot water, so I pop them in a sieve! The force of the water dissolves them perfectly, making mountains of bubbles and keeping my hands happy. 4. Before you hop into a bath with your favourite bomb or bar dissolved in the water, swish a scarf or knot wrap in it, then leave it to dry. It will smell just like your favourite bath fragrance! You could even put some in a spray bottle to scent your home. 5. I have a tiny sample tin of Gorgeous face moisturiser, and when I've used it up I will use the tin to hold hydrocortisone cream for my handbag first aid kit. You could fill them with any ointment or cream to take on your travels, or use it to hold tablets or hairbands. The screwtop lid will keep them secure. The same goes for their little glass lip scrub jars. Have you tried any of these hacks? 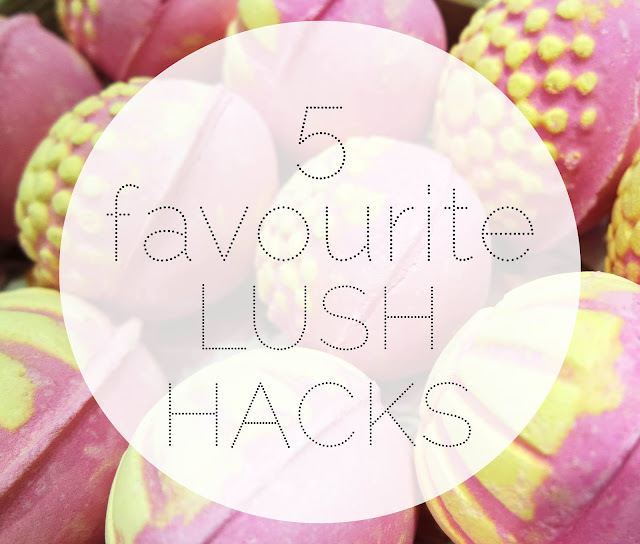 Let me know if there are new ones I need to try, and click over to Katy's blog to see her top LUSH picks.